The Gaia satellite has been making very precise measurements of stellar parallaxes, and the most recent catalogs have now been released. CfA astronomer John Raymond joined with four colleagues to apply the Gaia data to the problem of the Cygnus Loop distance by looking for absorption signatures from the gas in the two dozen stellar spectra, thereby constraining the stars as being foreground or background objects. Their result: 2420 light-years to the central part of the nebula, with a 3.4 percent uncertainty. 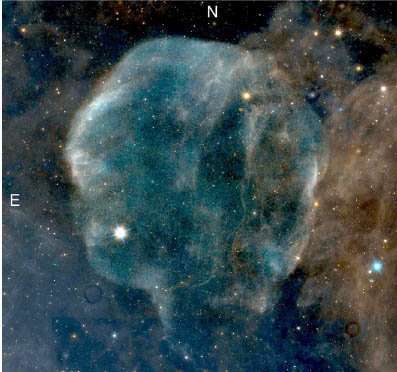 They also identified a star whose wind is interacting with the supernova remnant. The new distance result has several important implications. It means that the supernova that created the Loop had less energy than previously thought by perhaps as much as a factor of four (about as much energy as the current Sun would emit in six billion years). It also means that the nebula is probably aspherical in shape with the eastern being limb being closer to us than the western side and with a diameter of about one hundred and twenty light-years.